We know that for shorter breaks, many of our guests want to save the hassle of boxing up their own bike, as well as the expense (and stress) of flying it out to their destination. For this reason we’ve made sure that every one of our locations has convenient, quality road bike hire options available. This means that you can travel light for your journey, but still look forward to a high level of performance and comfort whilst you’re riding. Hire options vary from location to location, but are they are always full carbon road bikes with a good spec and geometry suited to the kinds of terrain you’ll be riding in that area. As an example, hire at our home base in the Northern French Alps is available in-house; we have a fleet of Scott CR1s with Shimano 105 and some brand new Scott Addicts with Ultegra, which are both ideally suited to the range of Alpine terrain around the Aravis. 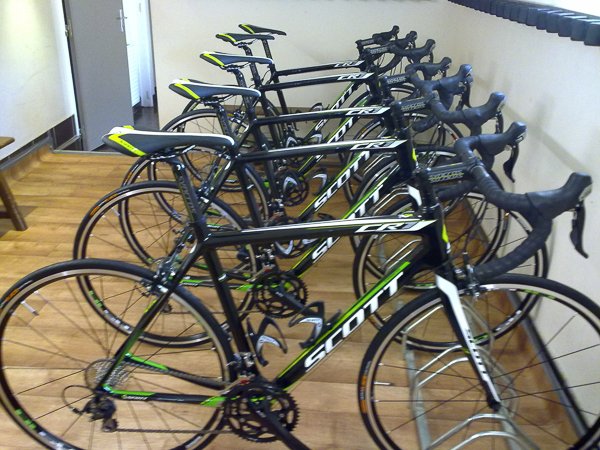 However, stocks of each bike are limited, so we may need to substitute the requested bike with an equivalent model. You can reserve your bike by clicking on the button at the bottom of this page, which will take you to our Bike Hire Booking Form. 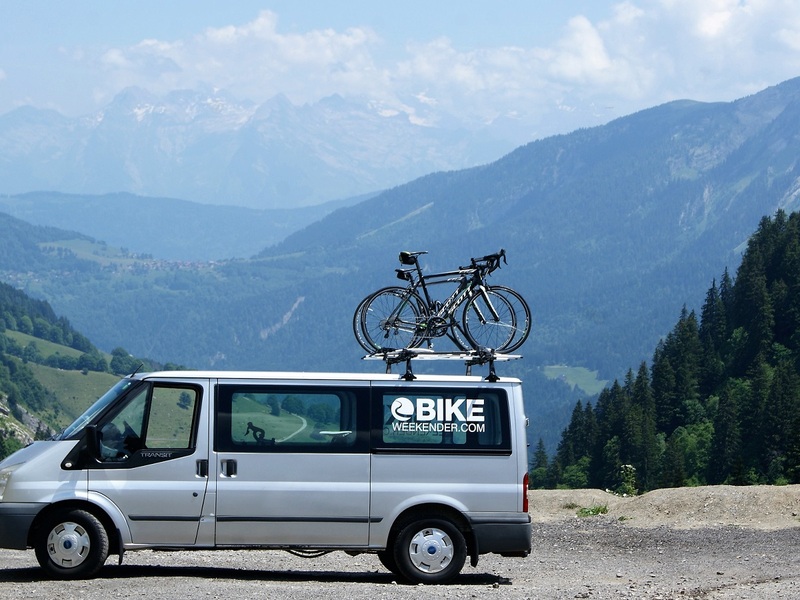 If you are interested in hiring a bike from us but are not a guest on one of our road cycling holidays, we can offer bike hire in the Aravis region of the Northern French Alps, from our base at the Aravis Lodge in St Jean de Sixt. We can also deliver to the local area. Please note – we do NOT have bike hire facilities for people who are not a guest on our short road cycling breaks outside of this area unfortunately. Bike hire needs to be reserved and paid for in advance, before arriving on your cycling break. On any of our standard ‘Classic’ or Bike Weekender ‘Lite’ 4-day Thursday to Monday weekend breaks, rental starts at £140 per person for 4 days full carbon road bike hire, payable in advance along with your holiday balance (6 weeks before arrival or immediately if you book within 7 weeks of your trip start date). If you can, please let us know if you wish to hire any bikes at the same time as you book – once your holiday has been confirmed you will receive access to your Online Booking Portal, which is where you can make payments and also submit a Bike Hire Booking Request with all of your requirements. The regular range of small, medium and large sized bikes are available for hire as standard, along with a limited stock of extra-small and extra-large bikes – please do let us know any requirements as far in advance as possible in order to secure the size you require. You’ll need to bring your own pedals – and if you have a particular non-standard setup it may be worth bringing your own stem. Many of our guests also like to have their own seat as well, to ensure your full comfort on the long rides. Bike hire for our Bike Weekender ‘Custom’ trips for clubs and larger groups of cyclists is priced on a case-by-case basis, as these breaks can vary in the number of days of riding on each trip. As an example, 4 days of hire would start from £140 per person, 7 days of hire over a weeklong break would start from £225. A full breakdown of prices is available on the Bike Hire Booking Request Form. All of our locations have secure bike storage on-site, plus work-space and tools available for those who choose to bring their own bikes and build them on arrival. Questions about Bike Hire on your Cycling Break?